FAO Director-General with Professor Zaid, FAO Goodwill Ambassador for the UAE. 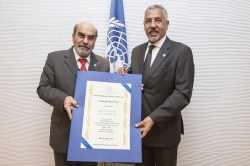 15 December 2015, Rome – FAO Director-General José Graziano da Silva today appointed Professor Abdelouahab Zaid as FAO Goodwill Ambassador for in the United Arab Emirates, in recognition of his outstanding work in the area of date palm production and protection as well as his support for the sustainable development of the Emirates’ agricultural sector. Professor Zaid has worked extensively in the field of date palm propagation and production. FAO has tapped his expertise for various food security and nutrition programmes, not only in the Gulf region but also in many African countries and on the global level. FAO Director-General commended Professor Zaid’s work and continuous dedication to FAO’s mandate and recalled his previous service as an FAO technical advisor, which in 1999 earned him the agency’s B.R. SEN Award for outstanding service. “I am sure that your knowledge, commitment and influence will prove highly effective in raising public awareness and encourage the promotion of sustainable practices in the United Arab Emirates,” Graziano da Silva said. “Your continued support and advice, as well as your technical leadership to regional and international agricultural activities, have been instrumental in the fight against hunger”, he added. "This is my opportunity to pay back both FAO and the UAE for all the knowledge, know-how and technology learned over 30 years and to work to assist in the field of agricultural innovation and sustainable agriculture in the country and the region," Professor Zaid said. "Date palms are the skeleton of life in the UAE. Without them, there is no future for agriculture,"he added. Professor Zaid has contributed to the program for the integrated pest management of date palm, where he played a key role in the development of the UAE’s date palm industry. Professor Zaid’s later involvement in FAO’s work in the country includes several priority programs in support of sustainable agricultural development, in particular the use of new, innovative technologies and in crops, livestock and fisheries production and systems to ensure food safety. He is currently the Agricultural Advisor at the UAE’s Ministry of Presidential Affairs and serves as General Secretary of the Khalifa International Award for Date Palm and Agricultural Innovation (KIDPA), which works to harness the UAE's leading expertise in the cultivation of this valuable tree and promote greater date palm research worldwide. Representing the KIDPA, Professor Zaid was also FAO’s main counterpart in the process that led to the designation of Al Ain and Liwa historical date palm oasis as Globally Important Agricultural Heritage Systems. The two date palm oases joined a growing number of ecosystems that are formally recognized by FAO for their importance as repositories of genetic resources, biodiversity and cultural heritage.